The cornerstone text in emergency ultrasound--fully updated and expanded Ma and Mateer's Emergency Ultrasound has virtually defined the field since the first edition was released. This trusted classic expertly covers the training, techniques, and diagnostic skills for successful point-of-care ultrasound with a special emphasis on problems most commonly encountered in the emergency or acute care s… etting. Features Consistent chapter organization: clinical considerations and indications anatomical considerations technique common abnormalities pitfalls case studies Coverage of trauma, cardiac, critical care, pulmonary, hepatobiliary, renal, testicular, and other ultrasound applications Side-by-side comparisons of normal and abnormal scans NEW chapters on pulmonary and critical care and expanded chapters on cardiac and musculoskeletal ultrasound An all New DVD demonstrates common ultrasound procedures in real time. 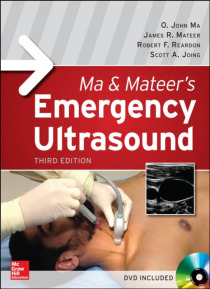 With its updated content, enhanced DVD, and outstanding authors, no other text improves your ability to diagnose in the emergency setting like the third edition of Ma and Mateer's Emergency Ultrasound.